Being upside-down is great when you're on a roller coaster, but not much fun when paying back a car loan. Being upside-down on a car loan means that you owe more money on the loan than your car is worth. Does it sound impossible? Unfortunately, it is a pretty easy situation to get yourself into. Did you know that a new vehicle loses 10% of its value in the first month of ownership, 20% in the first year, and 10% more each year after that? After just one month, your new $30,000 car is worth $27,000 – which means you are underwater if you paid less than a $3,000 downpayment. After one year, your car will be worth about $24,000, and after two years, just $21,000. Unlike an investment, your new car is a depreciating asset – it takes you where you need to go, but in the process, it experiences irreparable wear and tear that will eventually wear it into the ground. Because of this, you need to minimize your loan amount relative to the car’s value. 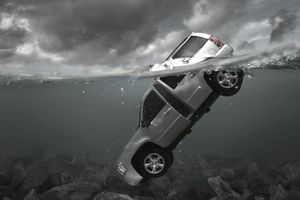 What Happens if You are Underwater on a Car Loan? Technically, nothing happens – unless there is a problem. If you are in an accident and your vehicle is totaled, assuming you have the proper amount of car insurance coverage, the maximum amount that your car insurance company is going to pay you is the fair market value of your car. However, if you owe more money on the car loan than this amount, you are going to be stuck paying back a loan for a vehicle that does not exist anymore. Thankfully, being underwater on a car loan is also easy to avoid if you keep in mind some general principles. Downpayments are your friend: The best way to ensure you are never underwater on your car loan is to make a substantial downpayment of at least 20% on any new or used vehicle that you purchase. This will help ensure that you do not go underwater on your loan and will help you pay off your loan more quickly. For a $30,000 vehicle, this means that you should be able to put at least $6,000 down upfront to stay afloat. A faster repayment period has benefits: The faster you pay back your car loan, the less likely you are to ever go underwater on a car loan. The longer you drag out a car loan, the higher the chances are that the amount you owe catches up to you. While a higher monthly payment may seem like a substantial burden, it is worth the financial peace of mind if you can afford it. In general, you should choose the fastest repayment period possible. A 36-month loan is preferable to a 60-month loan, which is preferable to an 84-month loan. Longer loans often come with higher interest rates while short term loans get the lowest rates. Set reasonable expectations: The most surefire way to avoid going underwater on your car loan is also the least fun – figure out how many cars you can afford and stick to your budget. For example, if you are making $36,000 a year, have $1,000 set aside to pay as a downpayment, and are willing to agree to a 36-month loan, you can reasonably afford a car that costs around $11,000. You will pay around $300 a month and will not go underwater on your loan. While $11,000 may not get you a fancy new car, it can buy you a reasonably-priced used vehicle in most cities. The more you make, the more you can afford, but that does not necessarily mean that you should “invest” in a depreciating asset. Even someone making a solid $100,000 a year with $10,000 to invest should reasonably buy a car that costs $35,000 if he or she hopes to pay it off in 36 months, according to Money Under 30’s car affordability calculator. If you want to stay above water, buy a car you can afford. Be reasonable with yourself and consider using an affordability calculator or speaking with a financial advisor. Choose the shortest repayment period that you can, and put as much money down as you reasonably can. If you practice a little frugality, you can keep your head above water and your peace of mind.